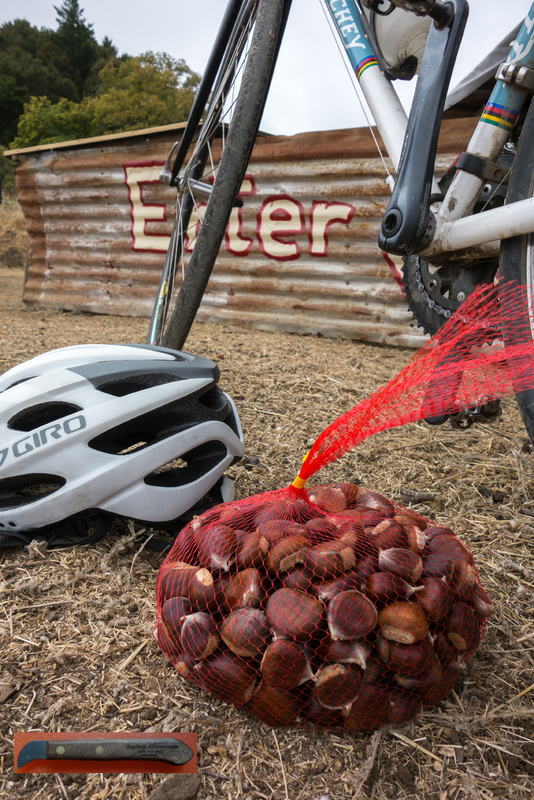 Chestnuts ready for the ride home. Chestnut knife shown at inset. Although the Bear Fire is not yet out, I didn’t notice any smoke this morning, so I headed up Hwy 9 to Skyline to fetch some chestnuts. Aside from all the garbage accumulating on the roadside, I didn’t notice anything out of place. In fact, for the first time in months, there isn’t any road work, at least not work with stoplights to control traffic. At Skyline all I saw was a sign saying the road is closed four miles to the south. Is that due to the road repair from last winter’s slide? I figure that’s it and not the Bear Fire, although I wouldn’t recommend going that way until it’s officially extinguished. Skyline Chestnuts is four miles north just off Skyline Boulevard, on Midpeninsula Regional Open Space District land. Follow the sign. I had already visited last Saturday, the official opening, and noticed the trees were yet to be dropping all of their giant, prickly seed pods. Today was a different story. Peak season is upon the orchard. I purchased three pounds along with a knife used for scoring the chestnut. What a fantastic tool! It’s a must have for anyone who likes chestnuts. Of course, no ride to Skyline is complete without a descent on Page Mill Road. I flew down, although not nearly as fast as Jobst Brandt used to do it when he was in his prime. There was no keeping up with him. After trying toaster oven, boiling, and steaming, we prefer steamed chestnuts. They get softer that way. The ones from Skyline are super sweet, better than the Asian variety and equal to the European, of which some of these trees are of the lineage, in addition to the North American native. As for the Bear Fire, I once rode down from Skyline starting at Las Cumbres right into the present location of the burn. That was back in 1994. More on that ride next. This entry was posted on October 19, 2017 at 5:01 pm and is filed under Ride reports. You can follow any responses to this entry through the RSS 2.0 feed. You can leave a response, or trackback from your own site.